The 1920s saw the Congress move toward the apportionment method it still uses today. Joseph Hill of the Census Bureau proposed a new method. His goal was to keep the ratio of one state’s “people per Representative” to that of another as close to 1 as possible. In a nutshell, he said to choose the size of the House, and then assign seats to the states so that no transfer of a seat can reduce the percentage difference in representation between those states. Edward Huntington, a schoolmate of Hill’s, saw the new method, corrected an error in Hill’s calculations, and named the corrected procedure the Method of Equal Proportions. The method can be effected by assigning each state the number of Representatives such that the ratio of “people per Representative” to the ideal district size (the “D” below) is as close to 1 as possible. This new method is equivalent to yet another method of rounding. In this case, though, the rounding is based on the geometric mean. The method is now commonly known as Hill’s Method, or the Huntington-Hill Method. To see how Hill’s method is equivalent to this rounding procedure, download the Hill explanation. The new method differed from the currently adopted Webster’s method in six states. Where they differed it was the larger states that suffered under Hill, not a good sign when passage of the method depends on a vote count in the House. In fact, for reasons we will not explore here, the Congress never re-apportioned seats in the 1920s, despite the Constitutional mandate to do so. Some in the Congress were so displeased with the state of affairs that a bill was introduced to enshrine a permanent apportionment method. What finally passed in 1929 was a bill requiring the President to send to the Congress apportionments based on Webster, on Hill, and on the method used in the previous apportionment. If Congress took no specific action, the method last used would automatically be employed again. In the 1930s, not only was Webster the last used, but Webster and Hill agreed. This good fortune did not extend to the 1940s. In 1941 the apportionments as computed by Webster and Hill differed in only two states. See the spreadsheet 1940 Webster vs. Hill. Webster gave 18 seats to Michigan and 6 to Arkansas, while Hill gave 7 to Arkansas and 17 to Michigan. It so happened that Michigan was a state that tended to be Republican while Arkansas was Democratic. A Representative from Arkansas sponsored a bill to use Hill’s method to apportion the House. Every Republican voted against the bill, while every Democrat (except those from Michigan) voted in favor. The bill passed and Hill’s method has been used to apportion the seats in a 435 member House ever since. Differences exhibited between the Webster and Hill apportionments repeatedly appeared. While the two methods were identical after the 2000 Census, they produced different results in the 1940 through 1990 apportionments. Why should they differ? 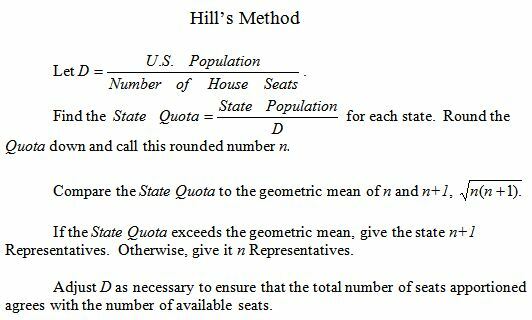 Hill’s method tends to favor the smaller states at the expense of the larger ones, since its rounding is based on the geometric mean. The geometric mean is less than the ordinary (arithmetic) mean, and since the difference between these is greater for smaller quotas, Hill favors those smaller quotas. On the other hand, the geometric mean is closer to the ordinary mean than the harmonic mean is, so the bias of Hill is not as pronounced as the bias of Dean. See the spreadsheet 1980 - 2000 Webster v. Hill for an illustration comparing the Webster and Hill methods for the last three apportionments. If you are interested you can find out more about two Supreme Court cases in the early 1990s. One upheld the validity of using Hill’s method to apportion the House, while the other allowed the Census Bureau to continue to count overseas military and civilian personnel and their families toward the populations of their home states. See http://www.law.cornell.edu/supct/html/91-860.ZO.html and http://www.law.cornell.edu/supct/html/91-1502.ZO.html for the texts of these decisions.